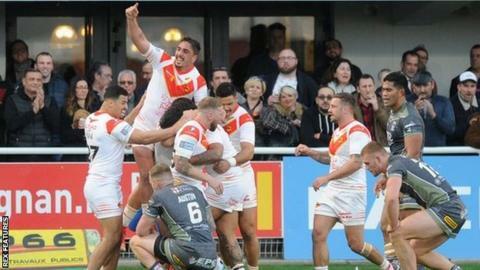 Catalans Dragons ended Warrington's 100% to the Super League season as they hung on to win in a heated finale in the south of France. After trailing 14-0 thanks to tries from Fouad Yaha and Tony Gigot, Wire were still 15-6 down at the break after Stefan Ratchford's converted try. Daryl Clark, Ryan Atkins and Dec Patton all scored second-half tries. But, after home captain Remy Casty's try, the second of Sam Tomkins' two penalties won it for the Dragons. The lead changed hands four times in the game's final quarter before Catalans went back in front with five minutes left to claim victory. Tomkins, who was on the Wigan team who beat Warrington when they last suffered defeat in the Grand Final at Old Trafford in October, kept his cool from 45 metres out for a fifth successful kick of the night, having earlier also landed all his three conversions. Having been kept in the game by Ratchford's try five minutes before the break, Dragons stand-off Gigot immediately replied with what was to prove an ultimately match-winning drop goal. Clark then reduced the arrears again just five minutes after the restart when he went under the posts, allowing Ratchford to convert again to narrow the gap to 15-12. Warrington did not lead until just before the hour when centre Atkins got on the end of Patton's high kick, Ratchford crucially missing the kick. Although Casty's try won back the hosts' lead, Wire thought they had won it when captain Chris Hill slipped an astonishing backhand pass to Patton, allowing the scrum-half to wrong-foot the home defence and go under the posts. Ratchford made sure of the kick for Wire to lead 22-21 but six minutes later, in a climax in which tempers became strained, Tomkins got the chance to settle the outcome - and end Warrington's season-opening run of three straight wins. "We are a better team defensively than we were this time last year. People underestimate the value that a full back does for you in that area. We got broke a few times and Sam Tomkins saved us. His communication is outstanding to the people in front of him. "And that was Matty Smith's best game for us so far. Matty sets himself high standards and has been disappointed in his performances the past few weeks. What people forget is that Matty has not played at the top level for the best part of a year, so he's getting back into that." "On the back of a 53 per cent completion rate in the first half, the boys have done really well to get back into the game in the second half and get in front. "But we just weren't good enough. Catalans are tough to play at home and the crowd got behind them. "We've got to learn from that. We've got to be better than that and we've got to close that game out." Catalans: Tomkins; Yaha, Langi, Wiliame, Tierney; Gigot, Smith; Simon, McIlorum, Moa, Edwards, Jullien, Casty. Interchanges: Whitley, Goudemand, Maria, Baitieri. Interchanges: Murdoch-Masila, J Clark, Philbin, Mamo.